Geographically, Europe is a subcontinent of the continent of Eurasia. But politically speaking, and by convention, Europe is considered a continent in and of itself. 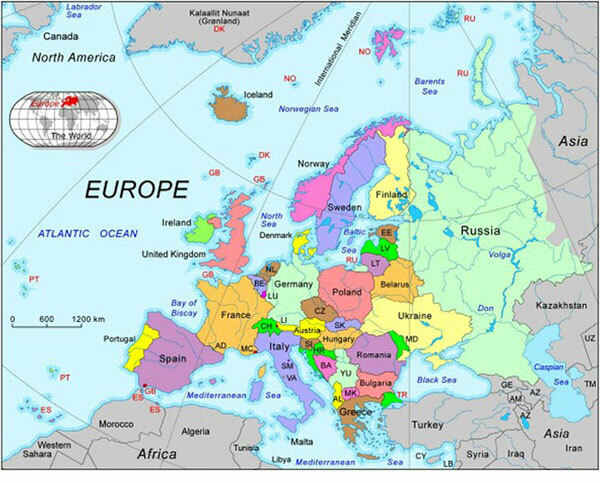 Europe is the second smallest continent, with 10,180,000 square kilometers of surface area. There are various definitions of Europe, with some people including countries that other people exclude. For example, Turkey is included in Europe by some people but in Asia and the Middle East by others. Russia, too, has territory in both Europe and Asia so it is hard to classify. But there are around 50 countries in Europe. 27 countries are member states of the European Union, an economic union with countries using the Euro as its common currency. The BND (German: Bundesnachrichtendienst) is the foreign intelligence agency of Germany, directly subordinated to the Chancellor’s Office. Legislative Act n.124 of 08/03/2007 reformed of the Italian intelligence agencies. SISDE, SISMI and CESIS were replaced respectively by AISI, AISE and DIS. The reform does not merely rename the old agencies. The new structure is fundamentally different from the previous system. The COPACO was renamed COPASIR (Comitato Parlamentare per la Sicurezza della Repubblica, Parliamentary Committee for the Security of the Republic) and granted additional oversight and control powers. In the Netherlands, there is no institutional separation between domestic security and foreign intelligence as the two secret services combine both tasks. In 2002, a major reorganisation created two Dutch secret services: the General Intelligence and Security Service (AIVD) and the Military Intelligence and Security Service (MIVD).